It's always more fun to see us in person, but in case you missed us, check out these pictures from our gigs. Do you want to book us for an event? Do you want to be on our mailing list? Do you want us to play Happy Birthday for a special someone at our next gig? Is Georgia on Your Mind? We want to hear from you, just email us at rivercitiesjazz@gmail.com! Check out where we are playing next! We were formed in the year 2000 by Mitch Biba out of Wisconsin Rapids. Our band is known for playing all varieties of genres and styles in a big band format, playing everything from the classics like Glenn Miller, to the soulful Aretha Franklin, and rockin' Guns & Roses. 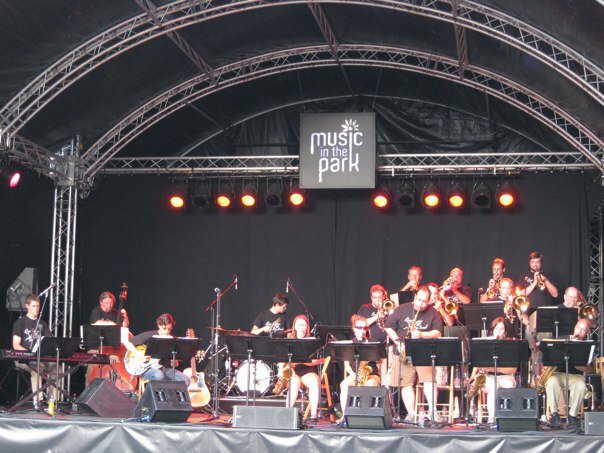 We have played all over the Midwest U.S. and a little bit of the world including a 2010 European Tour culminating in Montreux, Switzerland for their world class jazz festival. To keep track of us, join our email list and check us out on Facebook! Get to know our band here!